Above & Below: moving on up - the median home prices for downtown condominiums have continued to increase year-over-year (YTD Q3-2016) while the average days on market have steadily decreased. 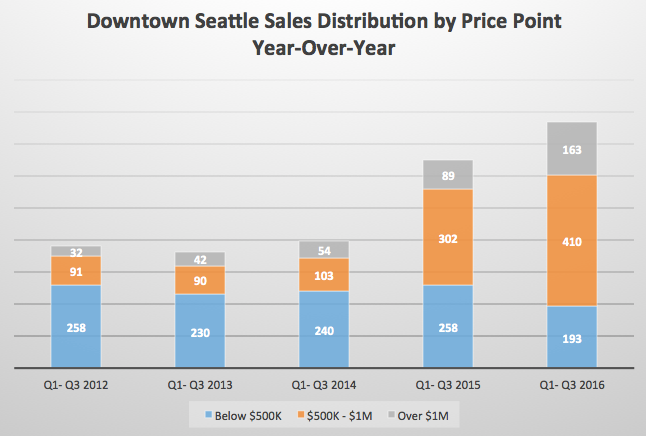 The demand to live in downtown Seattle isn’t limited to first time buyers or entry-level prices. Brokers at RSIR report increased sales with all products and price points. Median home prices in surrounding single-family neighborhoods are establishing new benchmark levels exceeding their prior peak in 2007 before the Great Recession cooled the market. Many empty nesters simply stayed put, awaiting the convergence of high resale values with exciting new condominiums to choose from before deciding to downsize. By example, RSIR broker Laura Halliday sold a 6,500 sq. ft. manse in Broadmoor for $6,150,000 with multiple offers in just two weeks setting a new price per sq. ft. record for the neighborhood. And RSIR brokers Enrico Pozzo and Rick Miner accepted a contract for a 2,088 sq. ft. floating home on Eastlake that was asking $3,400,000 after less than a month on the market. Jones points to a few pending sales that demonstrate condo confidence. On September 20thafter just two days on the market, RSIR broker Scott Wasner accepted a contract on a 5,170 sq. ft. condominium estate at Escala – the very unit and building was inspiration for the famous 50 Shades of Grey book and movie. Priced at $8,800,000, the home is among the most valuable condominiums in downtown Seattle and the closing will help establish a new product segment for trophy properties. Wasner also represented a buyer for the last unit at Four Seasons Private Residences, which was sold and closed at full price for $7,155,000 or $1,594 per sq. ft. after 2087 days on market – that’s nearly six years. A new development entity notably acquired all the unsold new construction units at Four Seasons Private Residences after the Great Recession. They patiently and effectively waited for the market to rise, which is precisely what happened.